VpCI-371 is a high temperature aluminum solvent-borne silicone coating that provides excellent corrosion resistance on metal substrates. VpCI-371 will dry tack free at room temperature in about 20 minutes to 5B hardness. After the coating has been heated it will have a 9H hardness. VpCI-371 should be thoroughly mixed prior to use. Apply by spray or dip. 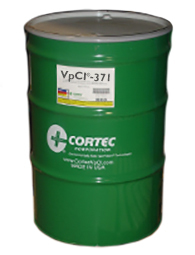 Available in 5 gallon metal pails (Cortec Product # 12400321) or 55 gallon metal drums (Cortec Product # 12500322). 5 gallon drum weighs 50 pounds and ships under our standard shipping rates. The 55 gallon drum must be shipped by truck. We will provide you with a freight quote before we ship this product. This item ships under Hazardous classification. Keep this package from freezing.